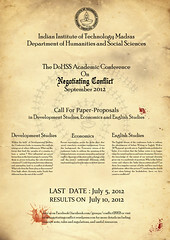 ‘Negotiating Conflict 2012’, in its English section, features as its headline concept, “Fractal Boundaries of Indian Writing in English”. Through this concept, and in keeping with the overall theme of the conference, we have tried to explore from different angles, the conflicts present in Indian Writing English. We attempt to look at this theme through three sub topics. Is Indian Writing in English dead? Indian Writing in English, despite a burgeoning market and increased exposure, is not exactly known for its variety. IWE has, to a large extent, restricted itself to certain mainstream genres of literature in which the more pioneering Indian writers pursue their craft. Even the more experimental of the more famous Indian writers have tended to stick to the ‘safe’ or conventional categories of literary writing. All this brings us to the question, is IWE dead? Does it have a vibrant and exciting future or is it condemned to a drab existence, where writers churn out works in the tried and tested formulae? Perhaps, what IWE lacks today is niche writing. India is yet to see a major onset of writers who cater to a definite portion of the reading public, focusing on a particular style, genre or method of story-telling. A majority of India’s writers seek, or have found, the approval of India’s small but ever growing literati, thus being forced into a general approach that aims to satisfy the more common of literary curiosities. While India’s internationally famous writers have succeeded with this approach, as demonstrated by regular international book releases and a handful of awards, the younger, upcoming writers find that a lot that can be said in this stream of expression has already been said. They are no longer like Adam in the morning, but the need to effectively create alternate Edens does not seem to have sunk in yet. There seems to be several untapped areas of writing and the line between what works in an Indian milieu and what has been untouched is blurred. Karthika V.K, published and Chief Editor at Harper Collins feels children’s literature is an important and even lucrative field most Indian writers have shied away from. “Giant wave? Not sure. I hope it has to do with children’s books because that’s what the gap in publishing now is really”, she says. A new bunch of writers who are brave enough to break away from the conventional or accepted genres is inevitable for the sustenance of IWE. The most prominent of India’s writers in English today have all managed to strike out a style peculiar to them and this has made them successful in the international literary scene. Salman Rushdie, Amitav Ghosh or Vikram Seth have all drawn their styles from myriad influences and have been inspired by several writers who preceded them. However, they are new and unique in their own right and this has made their writing, and IWE in association, stand out. Being pioneers in a sense of modern IWE, their writing has come to represent the norm, styles which have spawned several imitators since. Rushdie’s Midnight’s Children is often cited as the watershed work in IWE and understandably, there was a glut of imitators. However, the most successful writers after 1982, like Vikram Seth or Arundhati Roy, have avoided magic realism completely, or moved on to create their own style and form. Now they too have spawned a class of imitators but few successors. Meanwhile, several genres remain unexplored. Urvashi Butalia, co-founder of the publishing house Kali for Women, asks in half jest, “where is erotica in Indian writing in English today? There are none to be found. I would like to publish one!”. The market for IWE is still considerably small, especially when compared to the market for literature in other countries. This claustrophobic cabin can accommodate only so many names in a limited number of genres. Perhaps, as the market expands with time, more niches and genres will come of age in Indian writing in English. Through this conference, we would like to explore and examine the effects of some recent economic and political trends, broadly classified as globalisation, on the cultural production of post-colonial studies and Indian writing in English in particular. To what extent have these forces affected IWE and what explanatory models might be developed to account for literary tendencies and practices that are widely discernible? Indian writing in English took a major turn in the 80s and 90s, when it gradually relinquished the stereotyped India of snake charmers and meditating yogis for a more cosmopolitan and globalized approach in tune with the changing realities in India. IWE has risen meteorically since the 1980s, coinciding with India’s emergence as an economic power, spurred by the forces of liberalisation and globalisation. The idyllic Malgudi of R.K Narayan, or commentary on India’s social structure and casteism as pioneered by Mulk Raj Anand or Raja Rao’s simplistic and traditional Kanthapura looking forward to independence has all but vanished from IWE of today. Changes in style and form and the type of stories told have all changed dramatically in the past three decades. Obviously, an increased exposure to the world and its writings have taught young Indian writers to a variety of styles and genres, especially from parts of the world such as Latin America and Africa, which were labouring under similar yokes of post-colonialism. IWE has seen a major influx of writers who are young adults. These writers cater to a readership very similar to them in thought and taste and even socio-economic background. 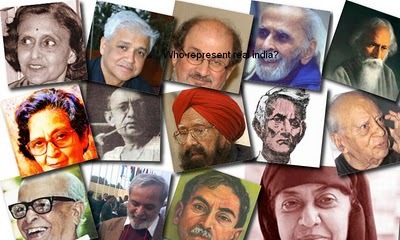 In the globalised age, these writers represent the face of a new India that is increasingly migrating to the cities and who assume a pronounced global and cosmopolitan identity as opposed to a pan-national identity espoused by writers such as Mulk Raj Anand or Ahmed Ali. The very fact that India’s most promising upcoming writers choose to write in English rather than any other language indicates their increased global consciousness and the desire or need to reach out beyond national borders, to a more global and even expatriate audience. Writing in English has become an easier way to reach out to the world which has gradually started to recognise India’s literary potential. One of the biggest outcomes of globalisation in the literary circles of India is that it has suddenly become profitable for Indian writers who ply their art in English to publish their writings. The advent of globalisation also marked a remarkable change in the way writers from India and their writings were perceived in India and abroad. A more global approach from Indian writers has been construed in several circles as a departure from “Indianness” as represented by earlier writers. These writers have been increasingly accused of being cut off from the “real India” and focusing on the glitzy and glamorous urban setting. Arising from this, among many other factors, is a new branch of criticism of IWE, the criticism that centres on the questioning and validation of the authenticity and ‘Indianness’ of a writer or a literary work. This oeuvre of criticism has flourished like a green bay tree and seems to affect almost every single Indian writer, living at home or abroad. As Salman Rushdie famously wrote, “the ironic proposition that India’s best writing since independence may have been done in the language of the departed imperialists is simply too much for some folks to bear. This issue is further complicated by the fact that any writer writing in Marathi or Bengali would not be questioned on ‘Indianness’. In fact, he or she would not be called an Indian writer, but a Marathi or Bengali writer. The fact that English was the colonisers’ language and still continues to be a language of power and privilege irks some critics and the issue of how Indian a writer is “becomes a favourite essentialising obsession”, in the words of Meenakshi Mukherjee, for several academic dissertations. We believe that the three sub themes selected represent various aspects of our main theme, “Fractal Boundaries of Indian Writing in English”. Through these sub themes, we have attempted to provoke thought on the various ways in which IWE tries to transcend stifling boundaries and engages in conflict with conventional norms. We certainly hope these topics can instigate a lot of discussion and debate at the conference and provide a platform for several enlightening papers. This entry was posted in Articles, Detailed Write-up and tagged Articles, Conflict, Detailed Write-ups, English Studies, Indian Writing in English. Bookmark the permalink.